This is a summer smoothie recipe that will help you lose weight and at the same time it will boost the energy level so that you can charge your batteries for all summer activities that you can think of. Summer is that period of the year when you want to be surrounded by happy people with positive energy and you want to feel refreshed and relaxed. Swimming in the ocean, volleyball on the beach, jogging, roller skating, taking your children for a walk in the nearest park and so many other things to do when the weather is nice and pleasant. Raspberries are rich with antioxidants, vitamins and minerals necessary for proper metabolism of fats. If you aim at losing weight and burning fat without too much effort, then you should consider implementing these delicious berries as part of your daily meals. Ketones in raspberries prevent an increase in overall body fat and cause the fat within cells to be broken down more effectively, helping the body lose fat faster than before. Apricots and peaches are referred as “Feeling Good” fruits because they can make you feel good and have a calming effect on the nervous system. They can naturally increase the energy levels and help you to have flat stomach. Apricots are a perfect source of antioxidants such as Lycopene, necessary for promoting wellness and strengthening the immune system. In addition they play an essential role in a healthy weight loss program as apricots are low in fat and high in fiber which is a great formula for shedding pounds and burning excessive fats. They also improve digestion and promote regular bowel movements. What is interesting to know about apricots is that a handful of apricots is an ideal way of suppressing your appetite which can substantially prevent overeating and reduce your weight. 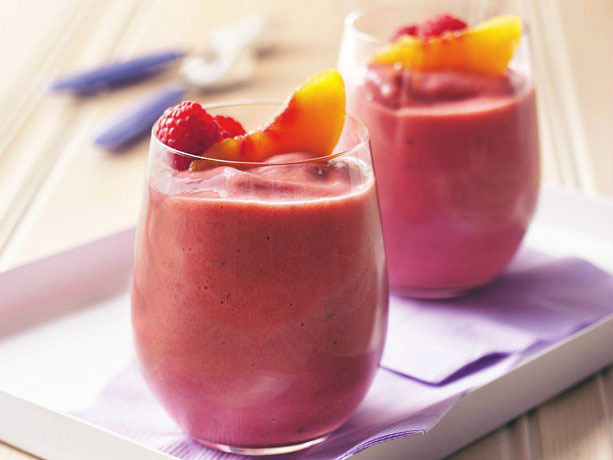 Whit this summer smoothie recipe you are helping your body to burn calories in a healthy way. And as addition you are raising the energy of the body and you will feel more refreshed. Remove the pits from the peaches and apricots and peel them. Place all the ingredients in a blender and blend for few seconds. Garnish with a peach slice and few berries. Turmeric Lemonade – Treats Depression Better Than Prozac!